The Westfield French Market is off to a rewarding start as the European-style, Bensidoun USA backed outdoor market adds new vendors and welcomes area patrons as they flock to enjoy the market’s offerings. Added to the growing list of vendors including B True Bakery, Hahn Bakery, KAP Farm, Organo Gold Coffee, The Blue Olive, Fraternite and Notre Dame. Also joining the line-up are Provence Imports, featuring table linens direct from Provence; Twin Garden Farms, bringing to the market their Mirai Corn, and The Bakeman which will offer gluten free products, most notably the Zen Brownie. To make the trip to the market easier for shoppers, Westfield has recently added ‘dots’ to all the Maps and Directories around the shopping center to guide guests to the French Market area. A-frame signs also have been placed at five of the major entrances to help navigate eager market shoppers through the center. 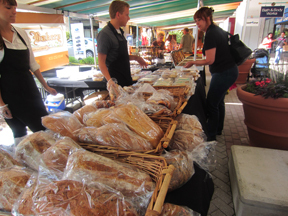 The Westfield French Market is open every Thursday from 2 p.m. to 7 p.m. through September and is located near Macy’s by the Koi Pond. It offers a variety of local artisan products including fresh produce, breads and cheeses and gifts for the home and family. For more information, call 847-673-6800.